Fortunately, Microsoft has provided maintenance plans as a way to automate the tasks required to maintain SQL database health. A maintenance plan performs a comprehensive set of SQL Server jobs that run at scheduled intervals. For example, a maintenance plan can include tasks that ensure that databases are performing optimally, are regularly backed up, and are checked for anomalies. SQL maintenance plans should be scheduled to run during off-peak hours to minimize the performance impact. 3. In the Object Explorer, expand Management, and then right-click on Maintenance Plans and select Maintenance Plan Wizard. 4. At the SQL Maintenance Plan Wizard screen, click Next to begin the configuration. 5. At the Select Plan Properties screen, enter a name and description for the maintenance plan. Several options are also presented for the scheduling of the maintenance plan. To configure separate schedules for individual tasks within a single maintenance plan, select Separate Schedules for Each Task. To configure a single schedule for the entire plan, select Single Schedule for the Entire Plan or No Schedule. If this option is selected, the Change button is available to configure the scheduling for the plan. 6. 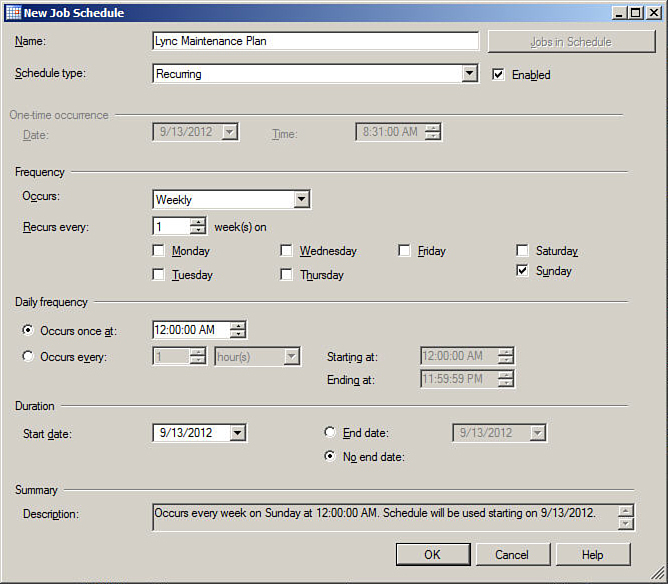 Click Change to display the New Job Schedule dialog box, shown in Figure 11. Select from the available scheduling options to configure the frequency and timing of the plan. When finished, click OK to save the schedule, and click Next to continue with the Maintenance Plan Wizard. Figure 1. SQL maintenance plan scheduling. 7. On the Select Maintenance Tasks screen, select the maintenance tasks to include in the plan, and then click Next to continue. 8. At the Select Maintenance Task Order page, review the order in which the tasks will be executed. If necessary, change the order by selecting a task and then clicking either Move Up or Move Down as needed. When finished, click Next. 9. The wizard now provides options for each task that was selected. 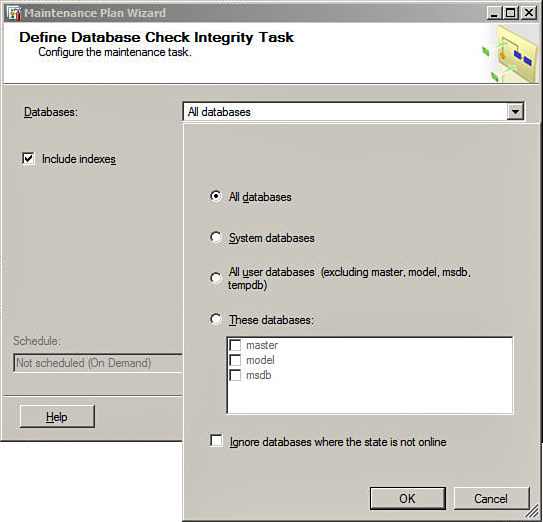 For example, Figure 2 shows the configuration options for the Database Check Integrity task. Using this example, the All Databases option has been selected for integrity checking. Figure 2. Configuration of the Database Check Integrity task. From the list of available maintenance tasks, the Check Database Integrity and Maintenance Cleanup tasks should be selected for all Lync Server databases. It is also recommended to not select the Shrink Database task, primarily because the automatic shrinking of databases on a routine basis leads to excessive fragmentation as well as excessive I/O, which can negatively impact the performance of Lync Server. 10. Continue the configuration of each task that was selected as part of the maintenance plan on each successive screen, selecting the desired options. 11. At the Select Report Options page, keep the default option of Write a Report to a Text File, and change the report file location if necessary. If an email report is desired, select this option and enter the target email address. When finished, click Next. 12. At the Complete the Wizard screen, review the listed options for accuracy and then click Finish to complete the Wizard.